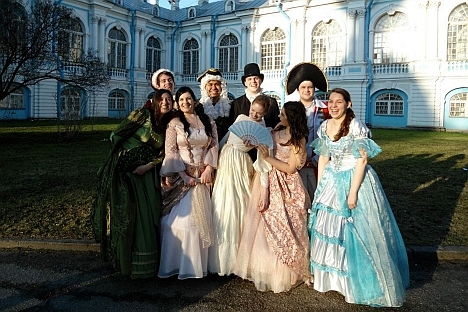 Serious American students find a great opportunity to delve into the Russian language and culture anytime of the year. Over the last five years, an average of 1,800 American students have gone to study in Russia annually. Many name an adventurous spirit as their main reason for going . They also hope that the experience will offer them a much better understanding of the culture than any text book. Also, there is this thrill of visiting the country that was considered America’s enemy for several decades. “I think I watched too many spy movies and decided that Russia had this Cold War mysticism about it, and I was intrigued by its Soviet past,” – said Raisa Monroe-Yavneh, 20, who studied Linguistics at the University of California, Santa Barbara. American students usually choose the two biggest cities, Moscow and Saint Petersburg, because of their intriguing history and concentration of universities. Top host universities are the Moscow State University and the Saint-Petersburg State University. The most popular Russia abroad fields of study are Russian language studies, literature, history, and politics. Teens get a crash course on living in U.S. According to Tim Boll, 22, who recently graduated from Miami University of Ohio with a degree in Russian, Eastern European, and Eurasian Studies, college campuses in the United States are more modern than their Russian counterparts. “Another difference was the fact that my professors [in Russia] were always “right.” Questioning their opinion was never a smart thing to do even if you knew you were right,” Boll recalled. In addition, as Monroe-Yavneh states, it was hard to get used to the length of classes. “At home, lectures generally last about an hour rather than an hour and a half. Thirty minutes may not seem like a lot, but comprehending Russian for that long can be pretty tiring. On top of that, it seems like Russians take a lot more classes per day,” she said. However, most of the learning–cultural or linguistic–was done outside of the classroom. “I loved the hospitality of the Russian people. I met some of the most generous people in the world there,” said Tyler Holl, a senior majoring in Linguistics at Georgetown University in Washington, D.C. What he disliked, however, was “the absurd amount of traffic in St. Petersburg” and the fact that “cash is king” in Russia. “I am so used to using my credit card or cell phone to pay for everything, and having to pull out bills and coins to pay for everything drove me crazy. And if I didn’t have a small amount of change, I would get dirty looks from cashiers because they didn’t want to give their precious 100-ruble notes away,” he recalled. For Bodner, the interaction with Russians also was the most beneficial part of his studying in Russia. He states that the widespread nature of nostalgia among Russians was a revelation for him. “I found the Soviet era to have an unsettling sort of inertia in the mentalities of many of the older Russians I met. My host mother in particular. All of the host mothers seemed to be very nostalgic,” Bodner said. Monroe-Yavneh in turn admits that in Russia, she was able to try things she could never have tried in the U.S. Apart from riding the platzkart (a typical couchette railroad car in Russia) and spending an evening at the ballet, the girl from sunny California will never forget spring in St. Petersburg. “It was amazing to watch the city come back to life after what was definitely the longest winter I’ve ever experienced,“ she recalled.